JOHN M. PECKHAM III, CCIM, CIPS, RECS, is Chairman of the Peckham Boston Advisory Company, a commercial investment real estate brokerage firm founded in 1963. 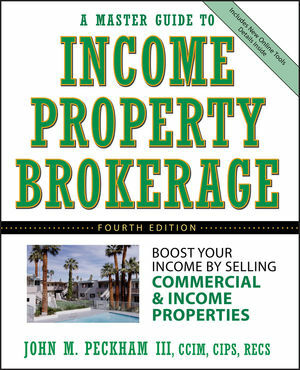 He has sold over a billion dollars of income property using the methods presented in this guide. In addition, he has shared these success-building techniques with over 100,000 real estate professionals in forty-four states and several countries. He is a former president of the Massachusetts Association of Realtors® and a former chairman of the Strategic Planning Committee for the National Association of Realtors®. He has been honored as Realtor of the Year by both the Greater Boston Real Estate Board and the Massachusetts Association of Realtors®. He is also the founder and Executive Director of the Real Estate Cyberspace Society (www.recyber.com), a 10,000-member organization that helps its broker/agent members leverage their effectiveness using many of the tools in this guide.